World Water Day 2017 has passed, but the intent of the event is not to get people to conserve water for just a 24-hour period. Instead, it asks that we all look at our water consumption habits, and make a change for the greater good. And while the UN sponsored day focuses attention on the importance of universal and sustainable access to clean water in developing countries, you can make a difference at home, in your community garden. Urban farming is a sustainable practice that seeks to battle food insecurities among other rewards that directly benefit the community, however, it can take its toll on local water resources. But it doesn’t need to. By implementing a few “best practices” with some inspiring ideas you can manage your community garden without having to tap into your local water reservoirs in excess. This is the simplest but no less effective of instructions. Nothing induces water-waste guilt quite like watering a large garden plot one day, to find that heavy rains arrive the next. When this happens, chances are you forgot to check your local weather forecast. By getting into the habit of doing so, you can monitor the arrival of precipitation and hold off on watering (where viable) until the day. Post a chalkboard near the shed of your garden. In the same manner that beach lifeguards chalk-up the tide and weather forecast for a five to seven day period, do so with respect to precipitation, changing it daily as the weather forecast adjusts. That way, anyone with watering duties can take note. Rain barrels are water tanks that are used to collect and store rainwater runoff. They are installed to make use of rainwater for later use, reducing the need to tap into local water resources. For your community garden or urban farm, this runoff can be funneled in from gutters/downspouts connected to the rooftop of your shed or neighboring building/s. Other rainwater barrels and harvesting systems can be set up in a catchment area (rooftops, etc.) to capture the rainfall directly which minimizes potential for any sort of contamination. 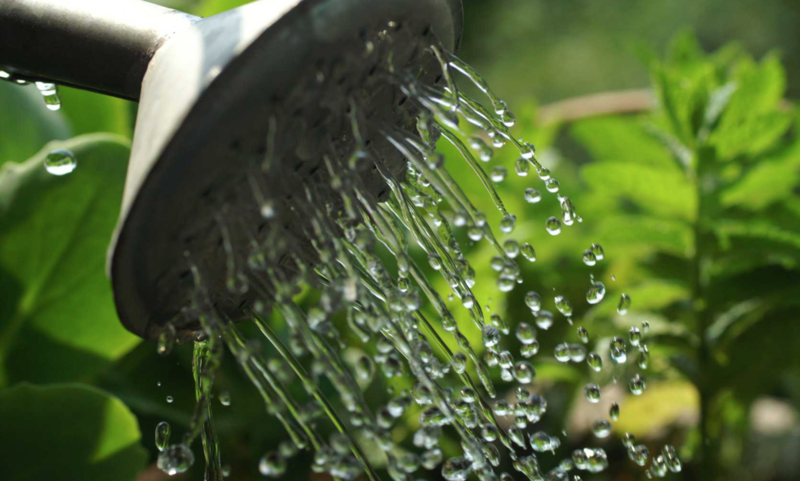 More sophisticated distribution systems can be created which will take stored rainwater and integrate it in with the existing watering system in your garden or farm. Nearly three-quarters of water can evaporate from the soil on a hot day. To prevent this, add a protective layer of mulch to your garden plot. Mulching prevents moisture evaporation from the soil surface. It also suppresses weeds that abscond with nearby moisture, preventing your crops from reaping its benefits. Employ a mulch with coarse consistency, such as bark chips. This will allow rainwater (or other) to transport itself down through to the soil at an optimal rate. For the best results, apply mulch onto already moist soil. It’s easy to over water when you don’t know for certain how much moisture your soil requires. Green-thumbs often pride themselves in knowing this by the touch of the soil. But it’s better to let science and technology be your guide. A soil moisture sensor will measure the volumetric water content in soil. The device measures this by using properties of the soil, that include electrical resistance, dielectric constant, or interaction with neutrons. Measured properties and soil moisture are calibrated, with results varying by environmental elements such as soil type, climate, and electric conductivity. Soil moisture sensors can be found at your local home and garden retailer, with prices widely ranging between $10 and $300. Whichever option you choose, this tool can go a long way towards preventing the overuse of water resources. Your community garden or urban farm has a very valuable resource – people. There are brilliant minds in your midst. These minds can work together to devise or find existing solutions for sustainable watering. 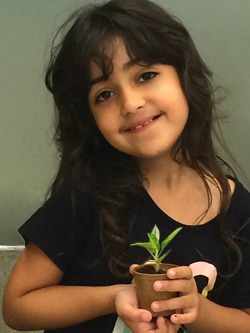 For instance, in North Vancouver BC, a self-watering garden project is underway. Co-founders of a local community garden came up with the concept to outfit custom-made cedar boxes with food-safe waterproof liners. The liners separate within the garden where the soil is on top and water is collected below. Borrowing from natural water table science, water is drawn from the reservoir up into the top soil. The method has reduced watering frequency from daily to once per week (or less). Even if you’re having a tough time brainstorming a new concept of your own, chances are that others have devised ways to positively impact water consumption in gardens. Feel free to borrow from these solutions and apply them (in part, or whole) to your garden or farm’s unique needs. Do you know of any other water conservation concepts that can be applied to community gardens and urban farming projects that you would like to share? We’d love to hear about them! Follow our Foundation on Facebook, Twitter, and/or Google+, find this article on our recently published posts and leave a comment. The Plant a Seed & See What Grows Foundation also encourages you to help others in need this season. Please visit this link to learn more about our work in Canada and be a Friend of the Foundation.